Nectar Aid Self Measuring Pitcher. Making Nectar as Easy as Can Be. Nectar Aid Self Measuring Pitcher. The fastest and easiest way to mix and pour nectar for Hummingbirds and Orioles. Nectar Aid is an exclusive proportional nectar mixing system that consistently mixes nectar at a 4:1 ratio. Add the same levels of sugar and water, then mix. Pitcher holds 52 ounces, or 1.6 quarts. Right now we don't have a firm ETA. Absolutely LOVE the convenient and time-saving Nectar Aid product! It makes constantly feeding the hummers so much simpler, not having to measure and mix the water and sugar separately then into another container! I am very pleased with the hummingbird pitcher that I purchased.I only wish that it was 2 cups larger as I have 2 feeders that each hold 4 cups and my hummingbirds are very active. I usually need to fill them daily. I like your measuring device for hummingbirds ~ works very well and makes the task of changing the feeders less troublesome! Very good piece of equipment! I love the hummingbird food measuring pitcher - will never use any other way to mix and measure food! Just hung up the Humm-Bug protein feeder and watching for Hummers to come eat fruit flies.. can't wait to see them! Thanks for making these superb products available to all of us Hummer-Lovers! Dr. R.S. Used my new hummingbird nectar container and I can only say it's the best thing ever! Wish I had known about it long ago. So easy to use and nothing to clean up afterwards. Thanks! The feeder is working out great. The hummingbirds started coming to it the first day I put it out. They really started coming in the first hour. The hummingbird pitcher is working out great to. The nectar protector doing its job keeping the ants away. Excellent service and I love my new feeders and especially the mixing container! Forgot my log in info. I love my nectar aid! The only thing missing from instructions is how long to put in microwave? Excellent service and I love my new hummingbird feeders and especially the mixing container! I really like using the nectar pitcher! It works! Very easy to use! Great, great customer service. I was missing one item, I notified the company, received an email right back saying it was being taken care of and it was completely corrected with the missing item in my hands within 3 days. Wonderful. 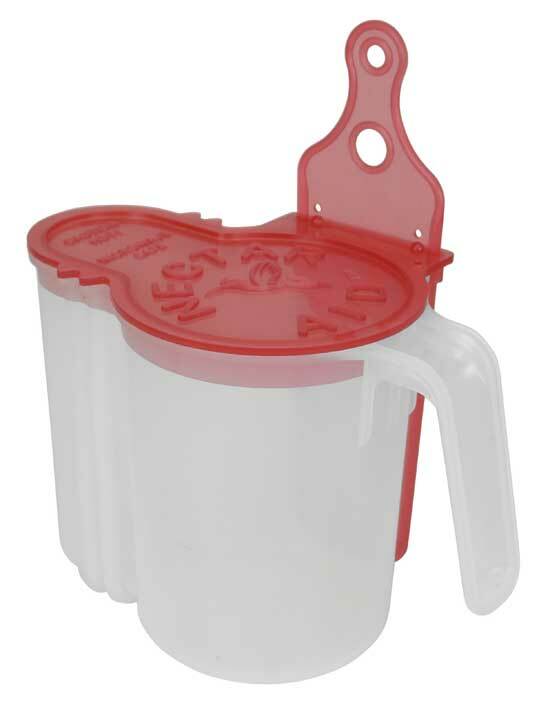 The nectar measuring mixing pitcher is the BEST!!!! My little hummers are here & I do think the little fat one was here last year! Thank you for following up on the hummingbird feed mixer I purchased from your store. It arrived in a timely manner and in good condition. It functions great, and makes it so much easier to fill my two feeders frequently as they're small and need replenishing often in our current 90 degree weather! Thanks for the great product and have a great summer!